The Comic Book Lounge in downtown Toronto will once again be accepting some Signature Series requests at Fan Expo Canada on August 28-31 at the Metro Toronto Convention Centre. CBL+G Owner and CGC’s former Director of Signature Series (from 2005-2010) Kevin A. Boyd will be personally accepting and overseeing the requests made at the CBL+G booth at Fan Expo Canada. We can pick up and submit prearranged sketch cover requests (if you need sketch covers we can provide as part of the request – please inquire re: availability of specific sketch covers). Not all artists will be willing to do sketch covers which is why we suggest you contact and arrange in advance to avoid disappointment. We can arrange commissions with some guests in advance on your behalf. Unfortunately not all guests and celebrities are available, and autograph fees are an additional cost above all CGC related fees. Please Note that with the 2014 show being in two unique buildings, we will be located in the South Building – the same building as the comic book guests, but celebrities who are doing public signings will be located in the North Building. For celebrity guests we are only accepting Witnessing requests at the event from attendees. We will accept submission requests in advance for comic guests (full service, where our Witness obtains the autograph). If you are not attending and dropping off books we will need them at the store by August 26th (2 days before the event). Many of the celebs will be ticketed (that is you buy a ticket and then come back at certain times to redeem them and get your item(s) signed). We are providing a Witness only for celebrity signings, we do not purchase or line up for autograph tickets (and exhibitors may be denied the option to purchase tickets for some or even all celebrity guests anyway). This way you are still able to meet the celebrity as well – the Witness will go with you and be in the vicinity to see your item signed. I also recommend that when you purchase an autograph ticket that you make sure with the handlers that they will sign your comic. Some guests will be only signing photos or in rare cases, only promotional posters, so please make sure you check first to avoid disappointment and problems in the line. If you plan on getting celebrities, we try to group times to ensure the availability of the Witness in the celebrity signing area as they will be traveling from the home base in the South building to the signing area in the North. + US$5 for each additional autograph above the first one on any item (unless they are beside one another). + Pressing fees, please inquire. Book can be submitted to CCS for pressing then passed along to CGC for additional costs. 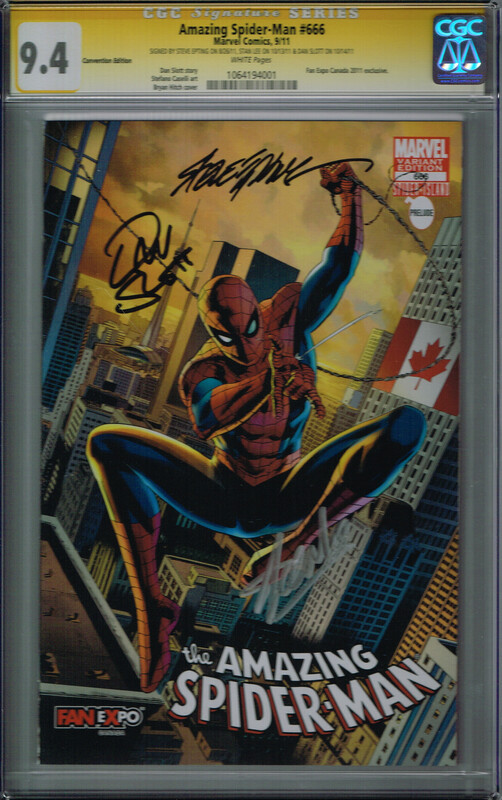 ALSO Please note: if you wish for us to submit under your existing CGC dealer or Collector’s Society account, the fee is US$15 for the first autograph acquired per item (+$5 for each additional autograph on the same item), plus shipping cost to CGC from Toronto (roughly $7). All CGC grading and invoice fees and return shipping will be billed by CGC to you on your account. Also please take note that we DO accept regular blue label submissions at the show and at the store. Cost is the CGC submission price per tier (no additional fees) + $5 CGC invoice fee + shipping to CGC and back to the store (more if you want them shipped to your home). Prices are converted to Canadian dollars using that day’s exchange rate. Currently US$1 = CAN$1.09. We generally have all items shipped back to the store in downtown Toronto for pick-up. We can have them shipped back to your house, but please be aware that the cost is significant and beneficial only if you are submitting a large request of 10 or more.